The waste heat from the exhaust of an internal combustion engine is generally hot enough to generate medium-pressure steam. In the case of small engine installations, steam production is not normally an economical option unless there is a local use for the steam. 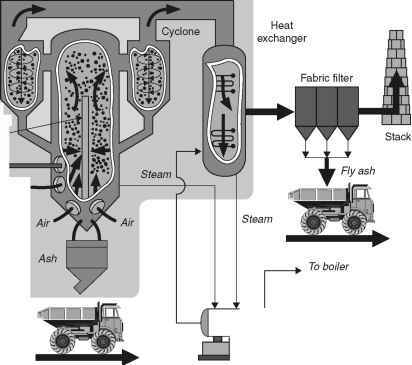 In the case of a large diesel installation, however, the engine exhaust can be used to generate steam in a boiler, steam which can drive a steam turbine to produce additional energy. This forms the core of a diesel-engine-based combined cycle plant. Typical of this sort of application is a generating plant which was installed in Macau in 1987.7 This plant was equipped with a slow-speed diesel engine with a capacity of 24.4 MW. The engine exhaust was fitted with a waste-heat boiler and steam turbine which could generate an additional 1.34 MW when the engine was operating at full power, thus contributing around 5% of the plant output. As a result of this and other measures a fuel-to-electricity conversion efficiency of close to 50% was achieved. Large engines of this type are frequently derived from marine engines and the original engines upon which they are based are not normally optimised for combined cycle operation. In particular, the cooling system is designed to keep the engine as cool as possible. For best combined cycle performance, however, it is preferable to run the engine as hot as possible. Combined cycle performance of a large diesel engine can be improved by modifying engine components such that they can operate continuously at a higher temperature. This results in a higher-temperature exhaust which can be used to generate higher-quality steam to drive a steam turbine. With these measures it may be possible to achieve a fuel to electricity conversion efficiency of close to 55%. However the additional expense of the waste-heat recovery and steam turbine will only prove cost effective if the engine is to be used for base-load operation.